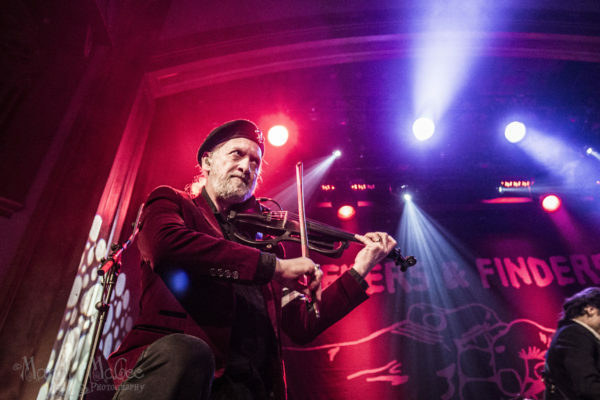 That Music Magazine » Gypsy Punk is Back Again! Gypsy Punk is Back Again! I apologize for not having this review out sooner but I got really sick. I’ve been sick for almost a month. I rested as much as I could so I could pick myself up to go to this show, because I love Gogol Bordello. Hailing from NYC, Gypsy Punk outfit, Gogol Bordello, has been a staple in my music life since I first heard “Start Wearing Purple” back in the early 2000s. It took me up to a few years ago to finally see them live. Last Tuesday night at the Neptune Theatre in Seattle was my 3rd time seeing them, and they delivered, yet another, unforgettable performance to a sold-out crowd. These musicians are nonstop energy machines throughout the whole show. Gogol Bordello came into the music scene in 1999 and has now released their ninth studio album, Seekers and Finders. 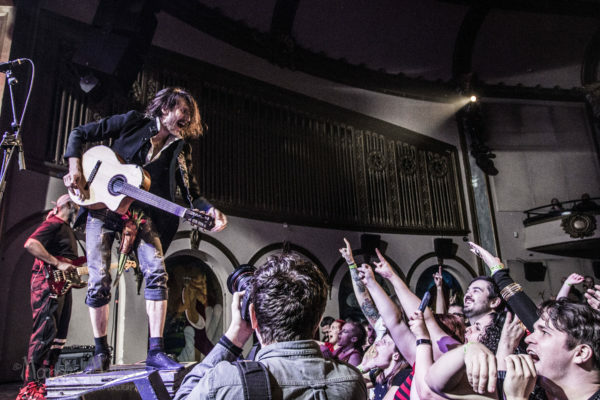 They use an array of instruments that reflect the all-encompassing nature of Gogol Bordello’s style, which mixes traditional Gypsy music with punk and dub. This musical melding serves as a neat representation of the cultural melting pot from which the band sprung. Though the band met in New York, the members are mostly from Eastern Europe and tell of their immigrant experiences through the use of many languages and culturally unique music through debauchery, humor, and costumes. 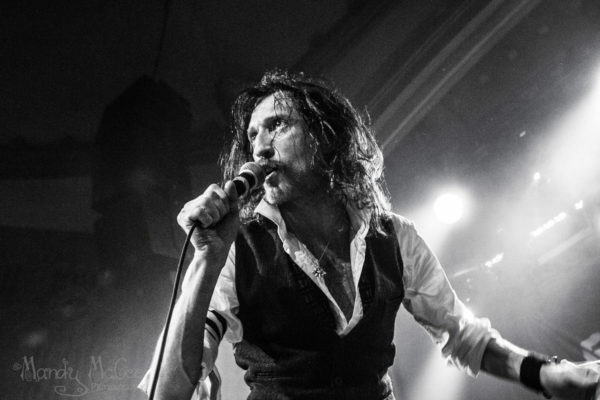 Lead singer, Eugene Hütz’s taste in music was spun out of black market tapes of the Birthday Party and Einstürzande Neubauten in his native Ukraine. 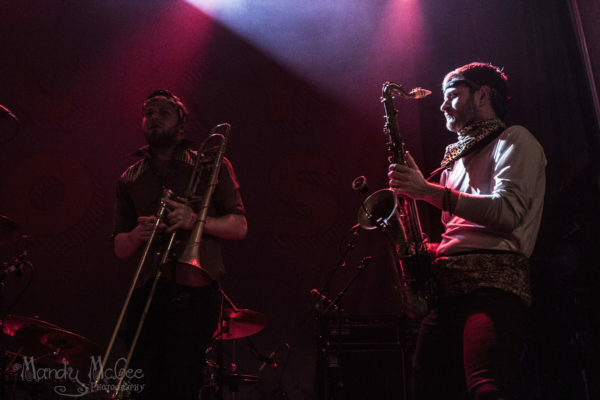 The night kicked off with a marching band style brass band, Lucky Chops, from NYC. Their performance was full of high energy and pop funk tunes. When they took the stage, the venue was only about half full with more people steadily coming in the building, but for the several rows in front of the stage, they were really digging this band. We have several marching bands here in Seattle and each one I have seen has not been the same, and it makes me so thrilled to see people rocking out with tubas, saxophones, trumpets, etc. Towards the end of their set, Pedro and Boris from Gogol Bordello came on stage to jam a little. I found myself dancing, which I was trying not to so much because I was taking photos, while these 5 incredibly sweaty musicians danced all over the stage. It started to make me miss my days in marching band in high school; maybe I should dust off my flute. It was a 30 min intermission to reset the stage for Gogol Boredello and when they were finally ready, the band charged onto the stage with Hütz, in tow carrying a bottle of wine. They broke out into “Break into Your Higher Self” from their newest release, Seekers and Finders with Hutz swigging and swinging around a wine bottle; the audience cheered loudly and eagerly. Highlights from the new album in the set include, “Saboteur Blues” and “Walking on The Burning Coal”, for the latter of which openers Lucky Chops join them (as they do periodically throughout the set). Even though the entire set was insanely riveting, I extremely enjoyed classics from their repertoire such as “Wander Lust King”, “My Companjera” and of course “Start Wearing Purple” (which I have a Burlesque act to). The audience completely agreed with me, as they were all singing along, dancing and crowd surfing. Each performer on that stage owned the night. From the funky stylings of bassist Thomas Gobena, to the vigorous bowing of violinist Sergey Ryabstev, to the relentless energy of percussionist and MC Pedro Erazo, to the entrancing dancing and harmonizing by percussionist/vocalist TOBI. I could go on and on and every member deserves praise on what they bring to the band; there were so many jaw-dropping moments. Gogol Bordello brought a non-stop, all-singing, all-dancing gypsy punk party using every inch of the stage, playing to every audience member, band members weaving in between each other, engaging in one stunt after another and improvising when things went a little unplanned. Eugene’s mic stand came apart several times throughout the set and towards the end, his instrument cable wasn’t working in one of his acoustic guitars. The show went on and the energy never dropped. These musicians all look amazing on stage and have so much chemistry between them. If you ever have a chance to see them live YOU MUST DO IT! It is one of the best live shows you’ll ever witness.